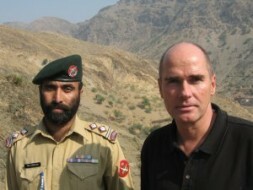 German entrepreneur and geo-strategist Dr. Hubertus Hoffmann, President and Founder of the World Security Network, at the Afghan border in the Tribal Areas (FATA) with an officer of the famous Khyber Guards (see Afghanistan & NATO’s Mission Impossible: A Radical New Grand Design Needed or Defeat is Guaranteed - Afghanistan: A new Grand Strategy for NATO, EU and the U.S. - Pakistan: Land in the Line of Fire). Recent reports from Washington, D.C. indicate that some officials in the Pentagon and CIA are considering continuing and even scaling up air strikes in the tribal areas (FATA) between Pakistan and Afghanistan. They argue that the use of air power, especially by Predator armed drones, is aimed solely at Al Qaeda. 1. Ineffective: For no less than seven years the U.S. has tried to strike terrorists from the air by using Predator unmanned remote-controlled mini-aircrafts against Al Qaeda – but without major successes. Even state enemy No. 1 Osama bin Laden has not been captured or killed – a shame to the CIA and the Department of Defense special forces. Why continue an ineffective air strike strategy? Only to show the superiors in the Pentagon, CIA and White House some "kind of action" and a naïve "we're doing something big"? 2. Shows weakness: This air-based fire-power only shows the extreme weakness of the CIA and Pentagon in the tribal areas, not their strength. This is because to be effective in the tribal areas, the U.S. needs many more human resources and smart intelligence actions on the ground – and not missiles into houses. 3. Too vague: The U.S. intelligence which leads to the use of missiles is mostly vague and can be manipulated by Al Qaeda easily in order to ruin the rest of the U.S.’ already low prestige and credibility in Pakistan. 4. Only U.S.-Pakistani cooperation is effective: Much more effective in the past years has been the capture of Al Qaeda leaders in close cooperation with the Pakistan security forces on the ground in Pakistan. Therefore the anti-Al Qaeda focus has to be a good, close cooperation with Pakistan. Exactly this is in danger by an air strike approach in the tribal areas, for three reasons: i) it offends the proud Pakistani people to see the military use of U.S. power on its soil; ii) it inflames anti-American resentments among the public and the important security forces; and iii) it leads to too many civilian victims and to blood revenge. 5. Effective ground strategy needed: A simplistic, easily executable, video game-like air strike strategy is counterproductive, and now smart ground operations, in close partnership with the Pakistan security forces, are the order of the day. 6. Counter-productive: The air-strike strategy produces more Taliban and supporters of Al Qaeda than it kills, as too many civilians of the tribes are killed and the tribes are forced into solidarity with Al Qaeda and the resurgent Taliban. For hundreds of years the law in the tribes has been blood revenge in case a member is killed. Therefore U.S. strikes and the killing of civilians work to turn whole tribes against the U.S. and NATO allies and into the hands of the Taliban and Al Qaeda. The Taliban is an ideology in the minds of tribal people. As such, it cannot be bombed out, but only neutralized through an appeal to common ideas and interests. Smart power is better than hard power. 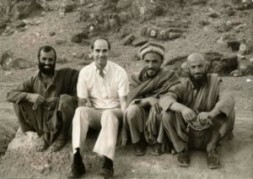 In 1985 Dr. Hubertus Hoffmann wrote the Report about Afghanistan for the European Parliament, for which he visited the Mujahideen in the mountains. He also organized fund raising for Afghan refugee children in Germany and, in a meeting, urged Pakistani President Zia-ul-Haq to deploy Stinger anti-aircraft missiles to the Mujahideen to end the killing of the Afghan people as quickly as possible. 7. Booby trap: The air-strike strategy is a booby trap helping Al Qaeda themselves – it is the most effective recruitment vehicle for them as it inflames hate against the U.S. and the Pakistani government. In other words: Al Qaeda and the Taliban welcome this obsolete air attack approach as well as their counterparts, certain ineffective bureaucrats in the Pentagon and the CIA. The first hope to win hearts and minds in the tribal areas, while the others seek to show that they did something big. This old U.S. strategy will weaken the fragile new Pakistani government, ruin even more the credibility of the U.S. and the NATO alliance in this region and produce more support for Al Qaeda and the Taliban. Therefore in all the tribal areas (FATA) there should be no more attacks by air at all, but only precise ground operations. The U.S. and Europe now must look for a fresh new approach to support the mainly moderate forces in the FATA, something now successfully done – albeit very late – with the Sunni tribes in Iraq after many years of a wrong approach there. We need a FATA Friendship Program including a massive civilian support of this under-developed region now to win the hearts and minds of the tribes, isolate the Taliban movement and Al Qaeda, stabilize Pakistan and Afghanistan and dry the swamp of terrorism there.